Oil Painting Medic: How do I Make Buying Artist’s Easels Cheaper? How do I Make Buying Artist’s Easels Cheaper? Shopping for easels to suit individual artist’s needs may not be a straightforward as one might think when budget and overwhelming choice comes into the equation. An array of seemingly complex contraptions, finely crafted in polished wood or steel would appear a requisite for the artist just starting out. But this need not always be the case. How can the best easel be purchased for the right price? Don’t make snap decisions on an easel that would appear perfect for use if there are others to consider. The best easel is not necessarily the most attractive, eye-catching or the first to present itself. Not thinking about individual needs when looking for easels. 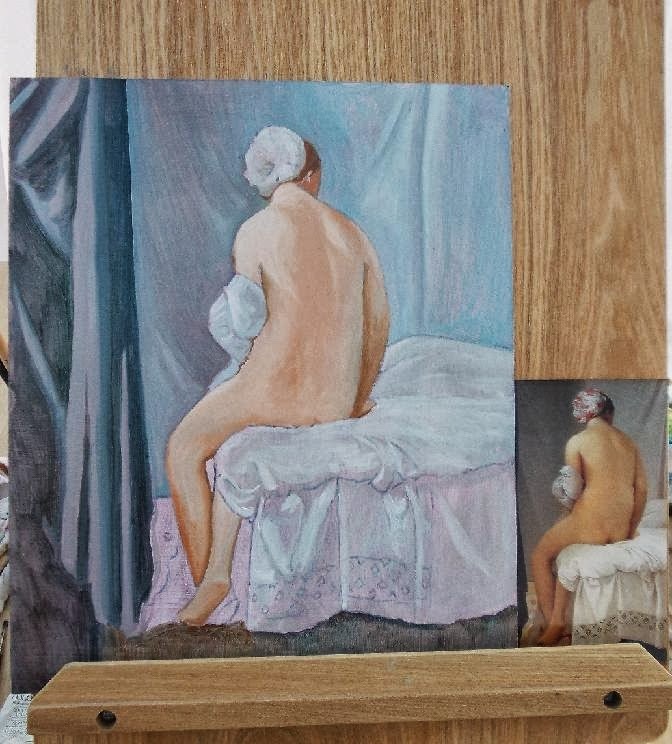 If the artist likely to paint small (creating works no larger than 2ft on the longest side) then, a large, studio easel would be surplus to requirement. Purchasing an easel that has flashy features that the artist is unlikely to use. 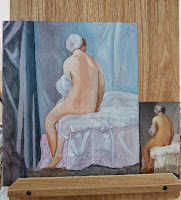 Opting for a display stand rather than an easel, which would prove a rickety compromise for a proper easel, causing the art surface to wobble around each time the paint is applied. Not testing out the mechanisms of the easel before purchase. The bolt and screw device that enables the painting support to be adjusted must work properly, or the painting will keep slipping down. Ensure the wing-nut engages with the bolt and that it tightens up securely. Check the thread on the screw to ensure there are no crossthreads that causes the wingnut to keep turning without tightening. Similarly, the ratchet locking system also needs testing. This makes height and angle adjustment of the easel possible. This mechanism also enables the easel to be folded away compactly. Keep the receipt in case the easel needs to be returned for any of the above reasons. Colleges and universities may sometimes sell off used easels. Ebay and second-hand shops are also worthy places to check out, but be certain the easel meets basic standards. Look out for woodworm, dry rot or signs the easel has been stored in a damp place. Again, ensure the locking mechanisms work properly. A battered-looking easel might serve the artist well, as dried-on paint and indentations can be sanded off and cleaned up. Really, easels can be thought of as 2 types: those for seated artists, and those for standing artists (or those that perch on a stool). The artist that prefers to sit at a table may find the table easel the best choice. The table easel as the name suggests is designed to rest on a tabletop, providing an angled support of the painting. 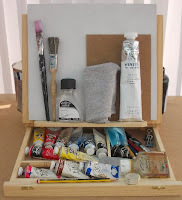 Some table easels have built in storage compartments that open up into a tray, where the paints, brushes and mediums can be stored. 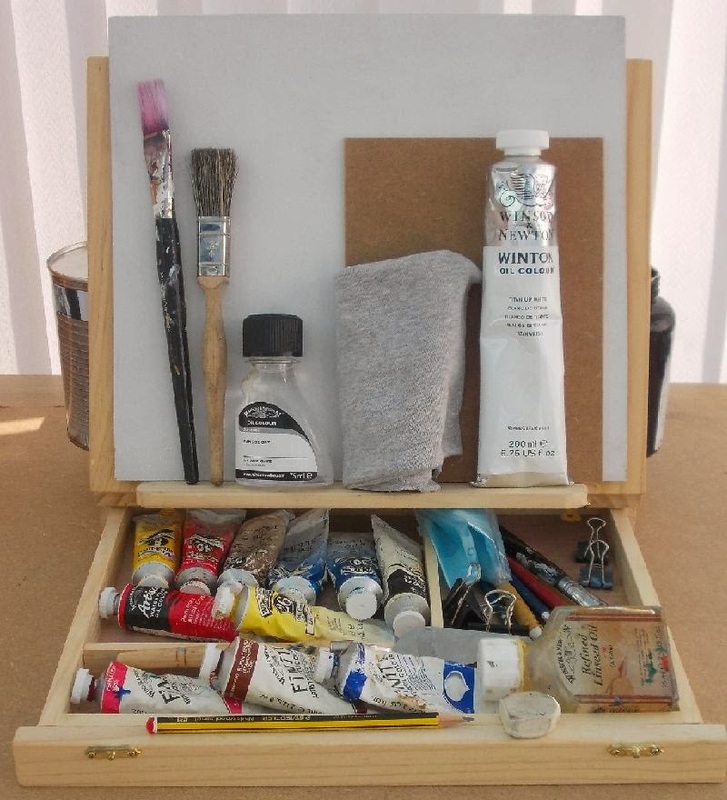 The pochade box (sometimes known as a cigarette box) is a smaller version of the table easel, providing a compact storage system for the artist on the move. The painting can be stored in a slotted compartment and rested on a surface when painting on location. Again, a small storage compartment makes possible the ferrying of the art materials during plein air painting. The artist who likes to produce larger paintings will need a firm support on which to rest the painting. In such cases, the A frame or H frame easel might be considered. The A frame easel (also known as the tripod easel) or its more lightweight version, the French easel are the most popular choices for larger paintings, as they can be easily folded up and stored compactly. The more lightweight versions often come with a carry case and collapsible stool. The artist lucky enough to have a large studio with ample storage for large paintings may consider the studio easel, or H-frame easel. These sturdy easels will support very large canvases or heavy panels whilst the painting is in progress. Thinking about the needs of the artist before purchasing an easel is important. Space, budget and the size of the paintings should be factored into when it comes to choosing an easel. I like to keep it simple. I have an old A-frame easel for larger paintings, and a small table easel for small oil sketches. Gadgety easels with unnecessary accessories will only cause the artist to pay for things that may not be used. Second-hand easels are great if budget is an issue, but look out for woodworm and faulty mechanisms. Paint splashes can be sanded off and the easel restored to new. Personally, I find a paint-splashed and used-looking easel more appealing than a brand-new one. The pochade box or the French easel might be the ticket for the artist on the move. Some come with a carry bag and a collapsible stool for plein air painting. How do I make oil painting cheaper? There really are a lot of choices where you can buy second hand easels that are still in good quality. We can still bring our interior painting ideas into life with inexpensive materials.